Ever heard of Campi Flegrei? It is a supervolcano in southern Italy. Literally translating as “fields of fire,” only the Yellowstone caldera in the United States has more potential to devastate. The Naples urban area, with its four million inhabitants, extends within this amazing volcanic complex, though it lies mostly beneath the sea. The last time that Campi Flegrei erupted was less than 500 years ago, in 1538. It was one of the volcano’s smallest eruptions down the millennia, but it lasted a week and killed 24 people. You may think that the chance of living in a city where the weather is nice and warm and you smell history at every corner is well worth the volcanic risk. But before buying the tickets, note that Campi Flegrei and Mt Vesuvius, his more famous and much smaller brother (remember Pompei?) are just the visible scars of a supervolcano whose previous eruptions 35,000 and 15,000 years ago spread volcanic materials over an area of 10,000 sq km. The effects of an eruption of Campi Flegrei could dwarf those of any eruption recorded in human history, and, in the worst-case scenario, challenge human life on the old continent. This is possibly the moment where you start thinking about what scientists are doing to understand if and when such an eruption will take place. The good news is that the Vesuvius Observatory (OV), monitoring both Mt Vesuvius and Campi Flegrei, is the oldest volcanology observatory in the world. Here geologists, geophysicists, and physicists join forces in a unique environment to understand what’s beneath these volcanoes. A good example is the EU deep drilling project, which the OV sponsors. The idea is simple: you drill to a depth of 2.5 miles inside Campi Flegrei caldera to get sensitive scientific data and rock samples, and obtain geothermal energy from the heated volcanic complex. But what happens when you drill an active caldera like this one? As with many simple ideas, this project has been accused of being simplistic and somewhat dangerous, due to the fact that the drilling itself may cause changes in the state of the volcanic complex, triggering earthquakes and, possibly, a volcanic eruption. This is a perfect example of striking the balance between not doing enough to prevent a catastrophe, and doing too much. In the case of Campi Flegrei, the drilling was stopped by the local authority after only a preliminary hole had been drilled. In other volcanoes, the drilling caused no problems, but the debate about the safety of the technique rages on – and it has the added disadvantage of being very expensive. A possible solution may come from another, completely different question: is there another way to “see” inside a volcano without drilling? Using modern technology, we can look at distant stars and inside our own bodies. Can we do the same with a volcano? The answer is that although it is not the same, we can. You can’t use light to look into the Earth, at least not the “light” we employ to look at the cosmos. And there is no instrument that can scan a volcano like we can do with a human body. But the Earth and, to an even greater extent, volcanoes, talk to us continuously – although our ears are not particularly good at listening. Notice that I say “listening” rather than “looking,” since the sound waves from our voices are in fact the most similar to the Earth’s way of expression: earthquakes, producing elastic waves. When a strong earthquake happens it is similar to a shout that we record by measuring vibrations on the Earth’s surface. We can use this shout to scan the deep Earth interior, looking at how and where the velocity of the waves is changed by the medium. Having said that, the voice of a large tectonic earthquake is actually quite plain. 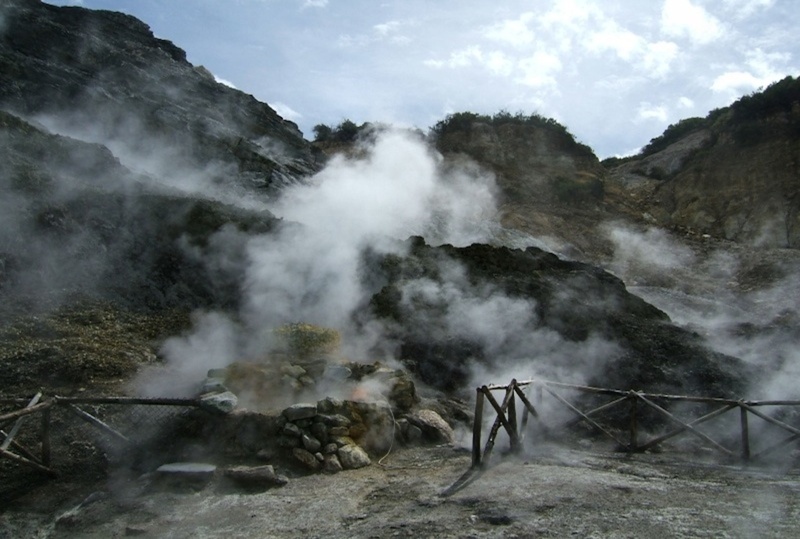 A supervolcano like Campi Flegrei speaks in much more interesting and various ways, with magma and hot fluids creating a song of continuous drumbeats and blasts. Volcano seismologists use this energy to produce images of what’s inside them. Here’s how this works, in simple terms. Think of loud music coming out of a stereo (the earthquake). If the stereo is in your room, you hear it strong and clear (the louder the nearer you are to it). Now put a wall between you and the stereo. The volume is lowered as the sound energy is either reflected by the wall or lost inside it. If you are able to measure which notes are lost the most and where “the wall” is you are performing an “attenuation tomography”: only that, instead of the wall, we are talking about a magmatic chamber. This technique is still relatively new. 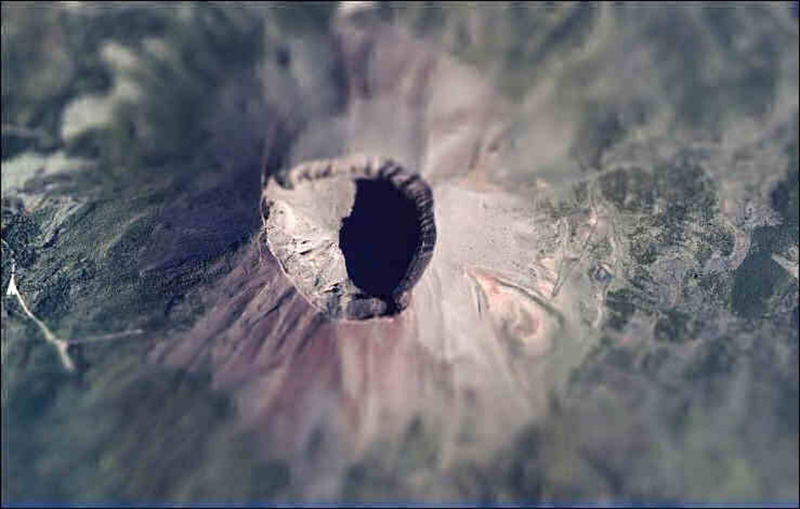 The Japanese developed it for their volcanoes in the 1990s, but it is only in the past decade that it has reached the West. It has also been applied to Mt St Helen in the north-western US and some South American volcanoes, but not yet to Yellowstone. In combination with other geophysical and geological observations, we have used this technique to establish that there is no large magmatic chamber under Campi Flegrei between 0km and 4km depth – at least there wasn’t during the last seismic crisis, which was between 1980 and 1984. So if you were thinking about relocating to southern Italy, perhaps this suggests that you would be safe and sound. It probably does mean that there is no immediate risk of an eruption of lava or magma, though you could still see eruptions of gas and fluids (a so-called phreatic eruption). 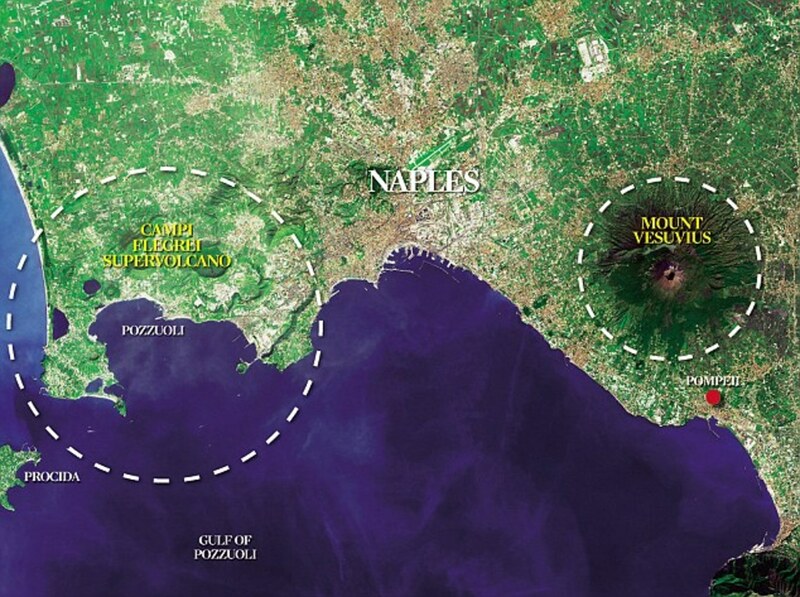 The volcano is alive and “breathes,” even inside the Naples urban area. You can see it in the way its surface goes up and down each year and you can smell it from the steam produced by the holes that the volcano has opened on the Earth’s surface. This “breathing” is a constant reminder to those living in the area, though it is possibly good news. You can think of it like a bottle of champagne continually losing pressure. Having said that, we do not know what’s happening deeper underground – except that there is probably magma at a depth of 8 km, which is quite a long way down, feeding both Campi Flegrei and Mt. Vesuvius. If magma is recharged and heated continuously, the pressure could grow and the lava could arrive to the surface very quickly – though with clear signs days/weeks before the eruption. A volcano scientist monitoring Campi Flegrei uses all these senses to understand what he would see if we could actually drill a large hole in the ground. Although we are still not perfect at it, we have at least started listening to Campi Flegrei’s voice.